No matter where I teach—at the Chicago Botanic Garden or at Edison Elementary in Morton Grove—I see how kids recognize the value of science education. For each of the last 18 summers, I have been a science teacher at the Garden. My own children grew up attending Camp CBG. It was—and is—a family tradition, and something my kids and I looked forward to each summer. Teaching Camp CBG is something I look forward to every summer. The Garden is an extraordinary science location. At the center of its mission are three core “beliefs.” All are excellent, but one correlates most strongly with my values as a science educator: “The future of life on Earth depends on how well we understand, value, and protect plants, other wildlife, and the natural habitats that sustain our world.” For kids, taking care of the Earth is a no-brainer, it is something we should all be doing, a “given.” It has been a privilege to be a part of the Garden’s mission. In 2014, camp director Amy Wells nominated me for the most prestigious award a science or math teacher in our nation can receive: the Presidential Award for Excellence in Mathematics and Science Teaching (PAEMST). I had the good fortune of being nominated before and achieved recognition as a state level finalist on three previous occasions (2006, 2008 and 2010). As it turned out, Amy’s nomination was the lucky one. Thanks, Amy! After being chosen as a 2014 state level finalist, I was awarded national recognition from the White House in 2015, and got to attend a special ceremony in Washington D.C. this past September with my wife, Tiffany. My twelve-year journey, from my initial nomination to my national award recognition, intertwines with my teaching at the Garden. Although it was challenging to wait 12 years to finally achieve this recognition, I came to realize it was a journey that forced me to grow as an educator. 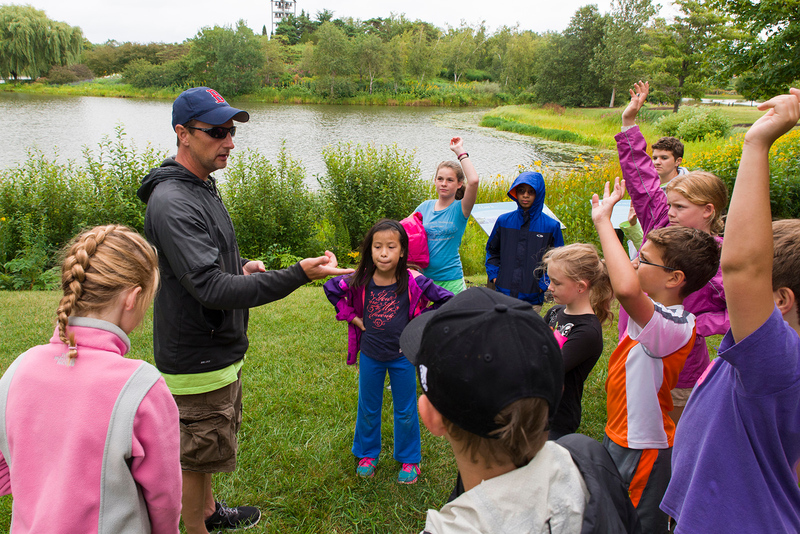 It made me a better teacher, no doubt, and the hands-on experiences at the Garden honed my skill set—benefitting my school kids and my campers at Camp CBG. Win, win, and win for all. Posing with my certificate between John P. Holdren, assistant to the President for Science and Technology and White House Office of Science and Technology Policy Director, and Dr. Joan Ferrini-Mundy, assistant director, Directorate for Education and Human Resources, National Science Foundation. The award ceremony in Washington was magnificent. To be evaluated by experts at that level and recognized by the White House was truly humbling. I was able to meet teachers from around the country who also shared a passion for science instruction. So much positive energy. While I was in Washington, and in the past few months since I discovered I won (while I was working with teachers in Kenya), I have reflected on my teaching history. I recognized that the Garden was such an important part of the teacher I have become. I’ve had the good fortune of teaching hundreds of kids here, in all age ranges, in an environment that maximizes science instruction. Here’s to another 18 years. 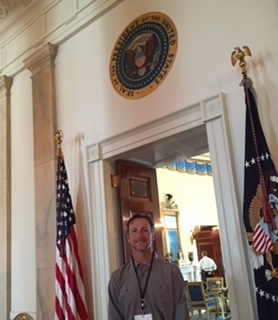 I got in a quick photo underneath the presidential seal at the entry to the Blue Room during our White House tour. Fourth grade science teacher Dr. Jim O’Malley, better known as Dr. O to students, has spent the better part of his career engaging kids by offering a mostly hands-on science curriculum where students learn by doing at Edison Elementary School in District 69. 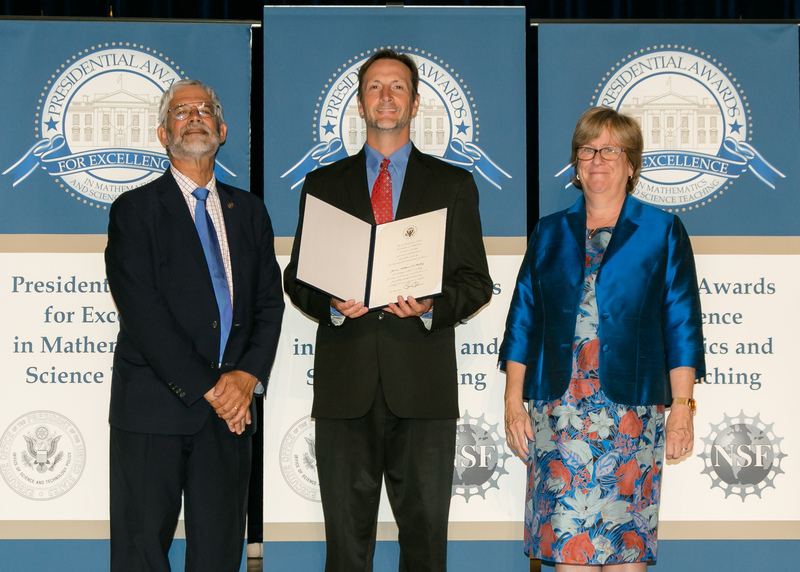 He was a winner well before being honored with the prestigious Presidential Award for Excellence in Mathematics and Science Teaching by helping students tap into their sense of wonder and curiosity as part of every-day science discovery.